Join the discussion on our forums! 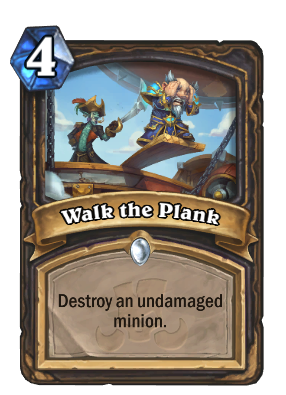 Come discuss Walk the Plank over in our dedicated Walk the Plank discussion topic. Pirates will fall for anything. Situational removal that shouldn't be that easy for your opponent to play around. Hard removal in any Even Rogue archetype. also assassinate for Even Rogue, which, as we established, is a very real possibility. How can anyone be down on this card? In any situation except Warrior enrage scenarios you have a 4 mana minion eraser in hand. In most cases it's Polymorph without the sheep. Lol, little boy, you still have a lot to learn on this game. Polymorph is so great and praised especially because of its difference with Destroy effects : it is a Silence effect. Now, you really don't seem to have played a lot of hearthstone to be thinking damage minions are almost inexistent outside of enrage Warrior matchups. Your opponent has a King Crush that just destroyed a 1/5 scarab, and woosh, it becomes impervious to your pretty little "I activate my trap card !". And there's a lot of time you'll see that happen. Logically, the biggest the minions are and the more chances they got to be having multiple board fights, and those re the minions you seek to destroy with this. Furthermore, I'll add by saying that the current trend is that big minions tend to have Rush more and more lately, which is the worst nightmare of this card. And FInally, with every card having a condition needed to be met, the opponent is granted with the possibility of fighting against it, so if this happens to be used frequently in the future, good players will always look for safe trades in order to negate this. Ok good point it couldn't take out a minion that is damaged from attacking with rush or charge. It's best against Lich King and the like. Control tool for Rogue I guess. because now it exist everyone will try to rush their big minions just playing around this. In most of the times that is not a missplay. Still this is a stricly good hard removal in most of the cases. Will see play atleast at one in every Rogue deck that can have Even cards. Looks like a fair card. Fair is not good enough for constructed. Moonfire is cheap free 1 damage yet you don't see it outside of one deck. Let's just say, if you were forced to pick, would you rather put Walk the Plank or Fan of Knives in your deck?